1. Take an old log, I used a downed cedar from my woods – drill 1 1/4″ holes about an inch deep around the surface. I specifically drilled the holes on a side that would face the spot where I shoot photos. 2. 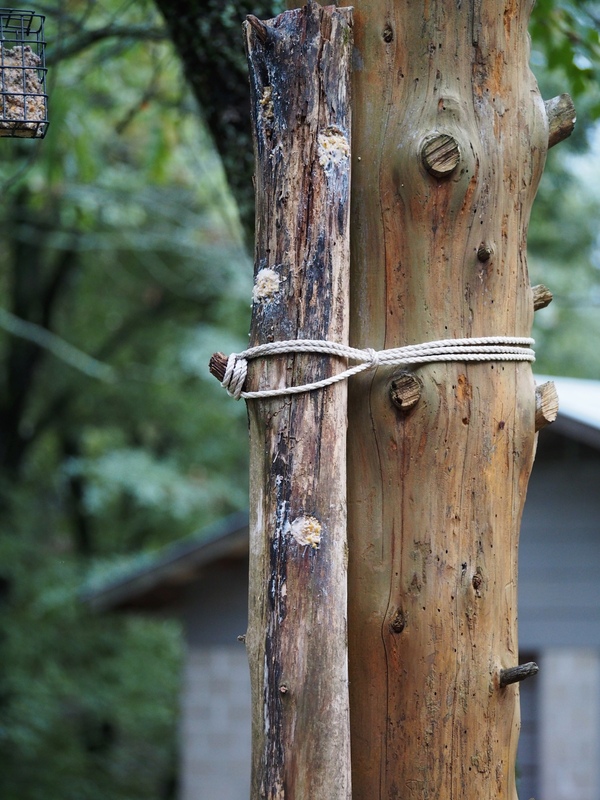 Attach it to something that will let it stand vertical like a tree – a fence post will do, I attached mine to the large cedar that holds up my pergola. 3. Fill the holes with suet. I also filled the cracks in the log. My friend says it’s like a social program where you are giving a handout and making the little buggers work for it. 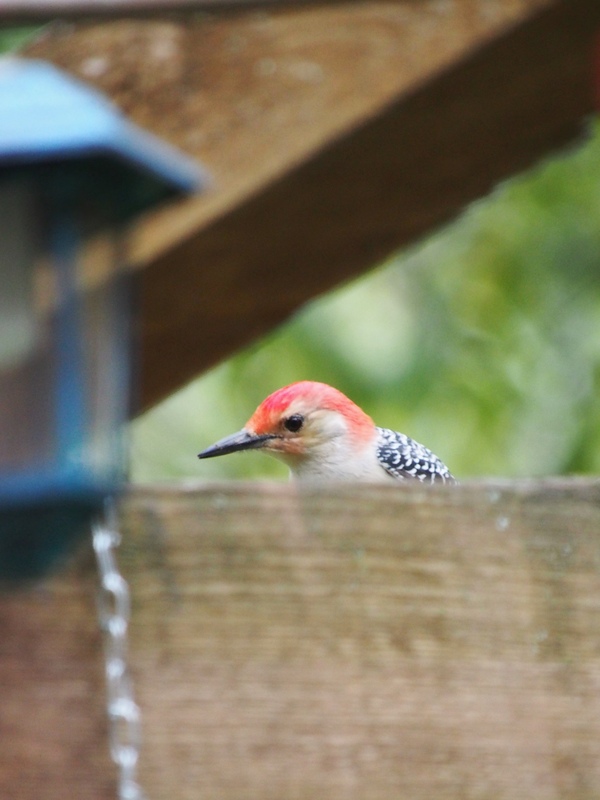 Tonight Woody stopped by – first he landed on the top of the pergola . 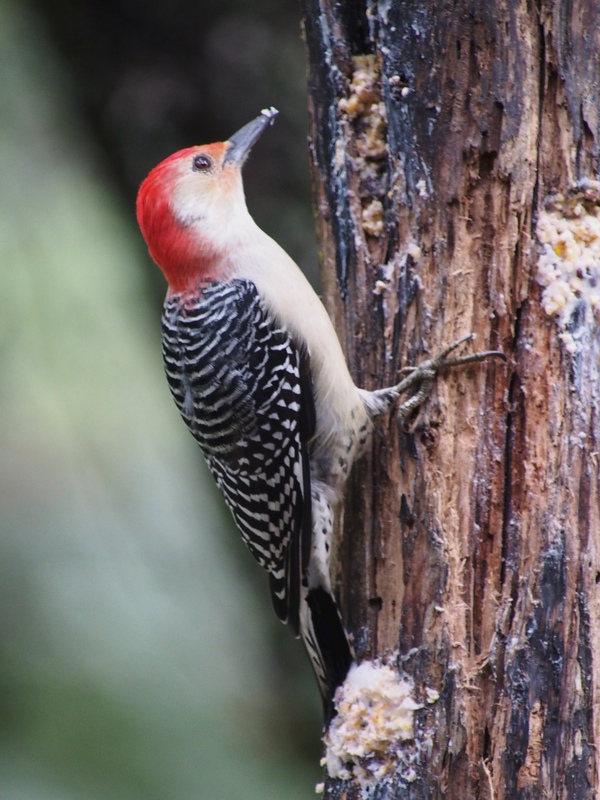 He takes a look around to make sure the coast is clear – today he must have been really hungry because my Goldendoodle was sitting about 6 feet away from the feeder watching him. And digs into that suet. And digs into the suet again. See the look of satisfaction on his face? He looks like he could use a napkin. 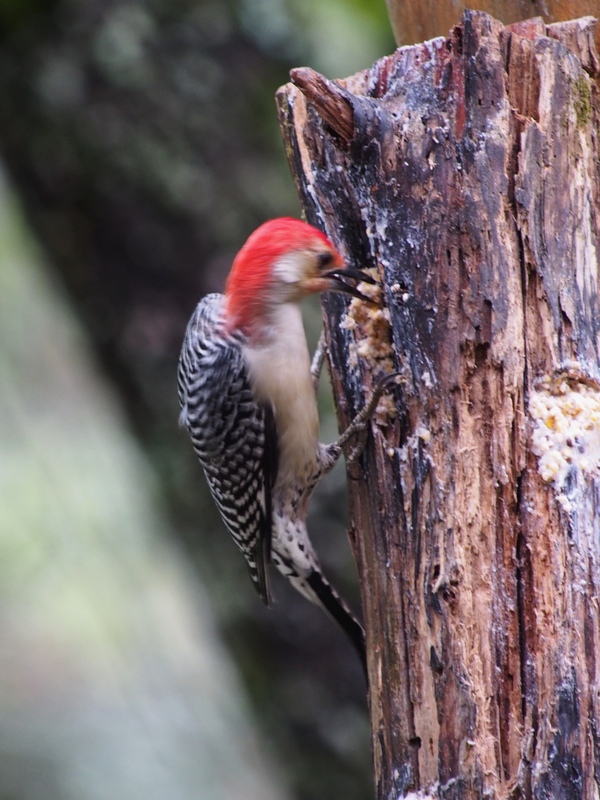 This entry was posted in birds, Ozarks, Photography, wildlife and tagged cedar, DIY Feeder, Olympus E-M5, OMD, Ozarks, photography, Red-bellied Woodpecker, suet, Woodpecker by artsifrtsy. Bookmark the permalink. Great idea and photos. The social program comment was funny. I have a suet feeder hanging from the eaves of my house. It dangles close enough to my window that the birds sling suet on the glass – that’s the downside. The upside is close-up bird viewing. I wasn’t sure they’d be bold enough to come that close when I first hung it, but they did; titmice, chickadees, flickers, several varieties of woodpecker. I’ve had a lot of trouble with squirrels and raccoons stealing from other suet feeders, but not this one. Your feeder, and photos are gorgeous, but are your squirrels getting fat? I have no squirrel issues because I have Jack Russell Terriers. They are on a radio fence and keep the yard squirrel free. I have a wood show outside the radio fence, squirrels are the bane of my existence there – arrrrgh. The terriers love suet though, they stalk the ground below the feeders. Spectacular!!! 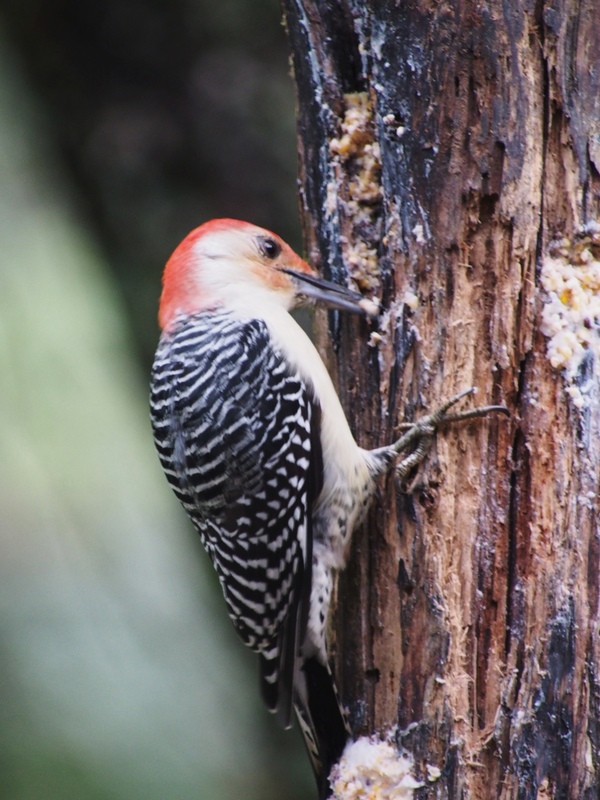 Our woodpeckers are nowhere near that colorful, although I’ve never seen one so close up. Congrats on such great photos!! Very impressive! Thank you – I really love seeing this guy close to the house. I must say I am jealous! So I’ll just enjoy your critters! Great idea and – again – amazing how you managed to get these wonderful pics! 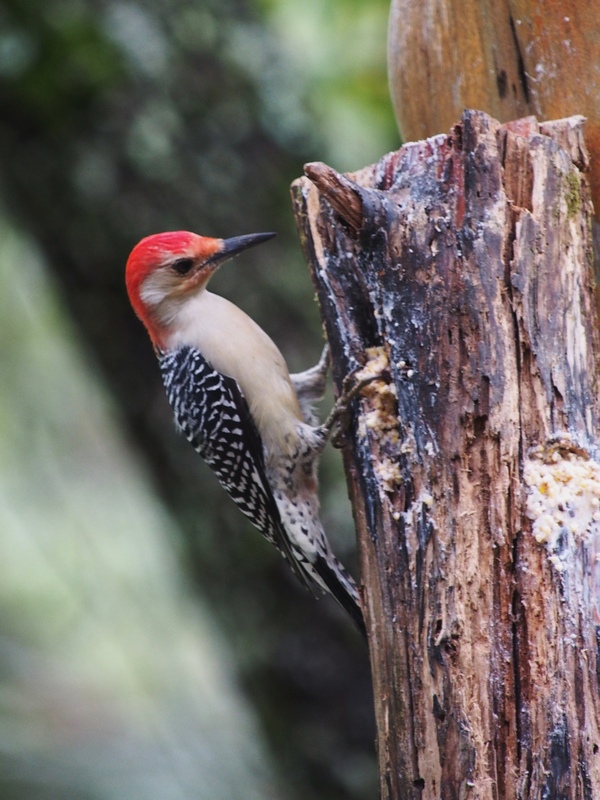 It’s really simple and it also only really works for birds who walk on tree trunks and large branches – so the smaller birds won’t be able to use the log feeder. I have seen this fellow try to use my other feeders and it’s a little scary to see how he nearly falls off of them because of his size. I have a female that comes to my bird feeder. This is a great idea! I will have to do it. I love the pics! I like that look of satisfaction! Awesome pictures, what a pretty bird. Thanks – I really like this guy. 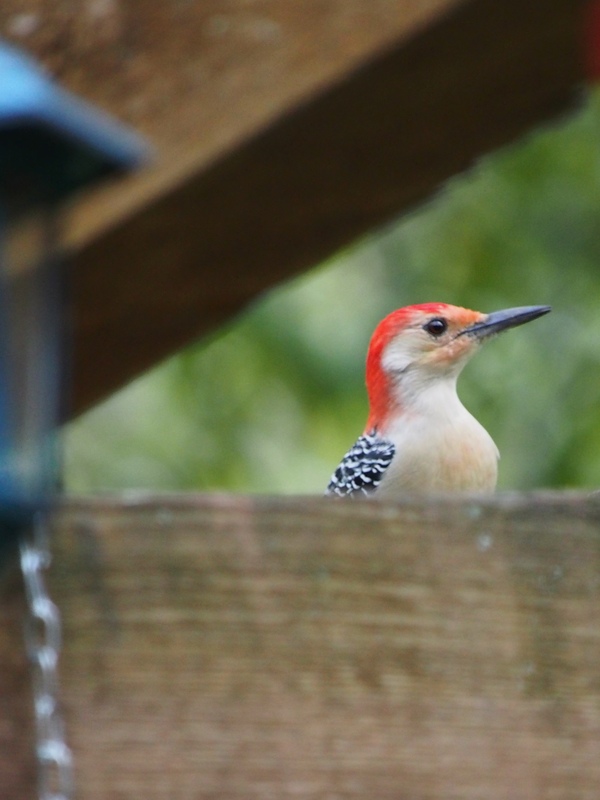 I had a pair of pileateds lurking but not quite ready to try the feeder out. Thanks! 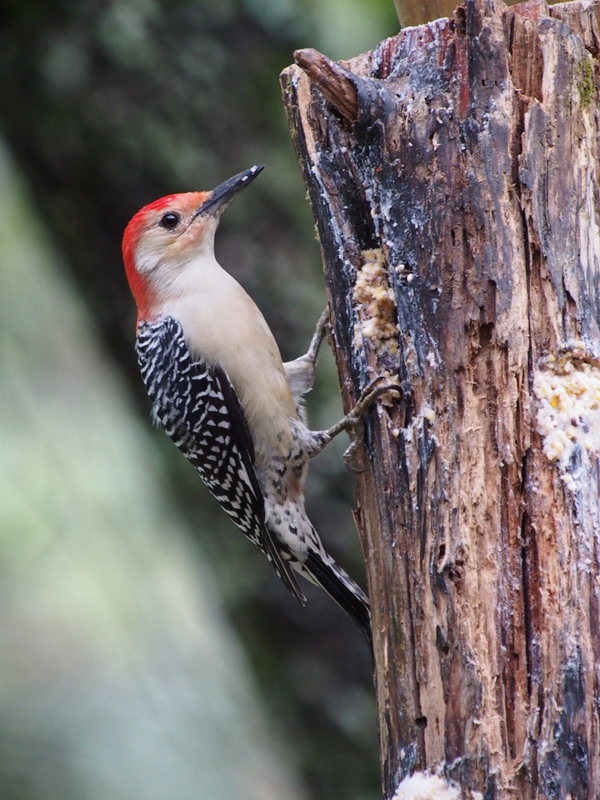 This is a male – but the female is very similar – a bit less red on the head. 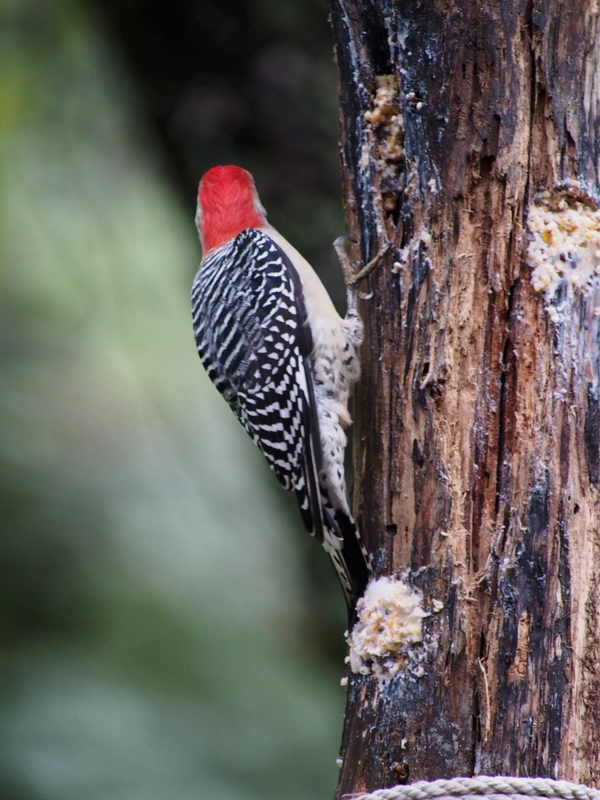 A lot of woodpeckers have read on their heads and checkered looking backs. I have at least three types here at the house.